Every year I look at the piles and piles of gourds that are for sale – you can find them everywhere from the local farm to your neighborhood Walmart. Usually cheap in price, gourds are colorful and certainly symbolic of the fall/harvest/Halloween season. Be that as it were, every year I’d find myself stumped with how to actually display gourds. My mom used to buy some every year and would simply put them in small piles around the house – some in the middle of the table, some on the china cabinet, etc. They always looked a bit haphazard and out of place. 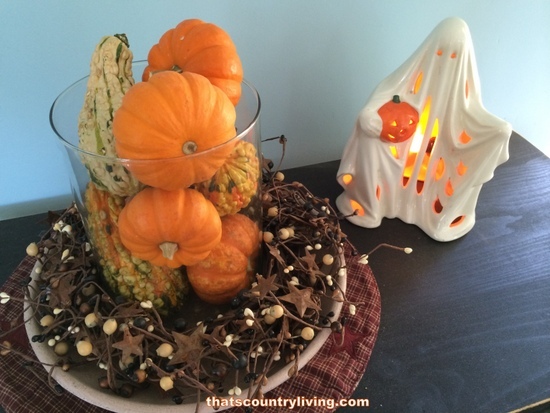 This year I resolved to not only buy gourds, but to find a place where they looked “right.” I’m pretty pleased with what I came up with – and it could not have been more simple! Next to our kitchen door is a small cabinet. 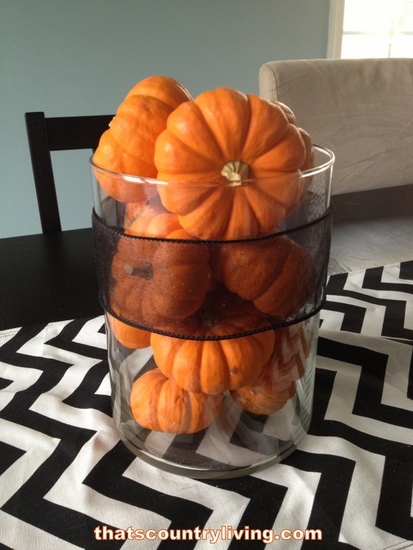 I took the hurricane candle out of the vase and simply arranged some gourds in it. This took all of 30 seconds. The second spot took a tiny bit more planning, but not much. I swapped out our usual blue/white chevron table runner for a black/white one – to give it that Halloween touch. I took an empty hurricane vase and wrapped a sparkly black ribbon around it. For this vase I wanted an orange/black combo so I only used the tiny pumpkin gourds. What are your quick and easy Halloween/Fall decorating tips? This entry was posted in ramblings, stuff i made and tagged craft, decor, decoration, diy, gourds, halloween, holiday, pumpkins. Bookmark the permalink.